For 2013 F-ONE presents the Bandit's little brother. A kite built and designed 100% for FREERIDE. The goal was to offer riders of all levels a kite with an intuitive feel, optimum relaunch, great stability and complete power control. The TRUST gives the rider amazing control of his speed, therefore providing a very smooth ride. Its main attribute being giving the rider easier control in his edging, it is living proof that a kite can also help significantly in absorbing chop and waves. Combined with its great upwind ability and exceptional stability in neutral positions, you will have complete confidence in the TRUST!! The kite is very predictable making the steering instinctive and very intuitive. With its direct steering, you will always know where the kite is in the sky ? just as if it was part of your own body. The first time you fly the TRUST you will immediately be able to take advantage of the kites full potential. Stability was at the core of its development and you know you will be in complete control of the TRUST regardless of the wind or wave conditions. Maneuverable and responsive this kite will very quickly give you the confidence to try some new moves. The DELTA C Shape originally designed by F-ONE remains the most progressive design in recent years to optimize relaunch. The leading-edge diameter tapers towards the wingtips, allowing the kite to pivot on its wingtips. 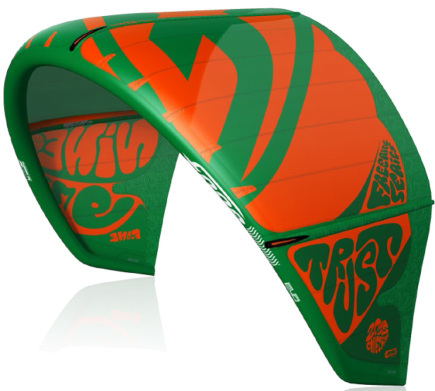 This new flexible design allows the kite to quickly relaunch when it is on its back. This auto-relaunch feature gives the rider complete peace of mind when riding or trying new tricks as he knows the kite will always relaunch. The TRUST was designed to give the rider consistent power and depower with smooth transitions without any twitching or jerking in the bar. With its great depower ability you can bring the power all the way down to zero, making you feel very secure in any conditions. The bar of the TRUST kite also benefits from the advanced technology applied to the BANDIT MONOLITH BAR and is similarly carved from a single block of aluminum. This tooling process enables us to manufacture the bar from single piece of aluminum. The TRUST will surprise you with its outstanding performance and give you amazing sensations of power and control every session.